Verdes FC ventures again on to the international stage as it travels to Estadio Maracama de Panama concluding its appearance in the 2015 CONCACAF champions play. Game time is 4 p.m. at Panama and it is most unlikely Verdes will move on. While a win gives them 7 pts to tie with Queretaro of Mexico, the Mexican team has scored 11 goals while conceding 3 for a record of 2 wins 1 draw and a loss to San Francisco of Panama. The Panamanian team can only achieve 6 pts from a win against Verdes on the 22nd and from 3 matches, they conceded 4 goals and scored 3 for a 1 and 2 record going in. No matter how you cut it, Verdes in 3 outings have won 1 drawn 1 and lost 1 but have conceded 9 goals while scoring 2 which puts their advancement to the 2nd round of the CONCACAF Champions League somewhat out of reach. However, Verdes has proved itself very potent at home and has not experienced a loss. Also Verdes FC is the 1st Belizean club to arrive into the 2nd round of this prestigious tournament, finishing 2nd in their group which hand them another milestone. Go Verdes history is before you. 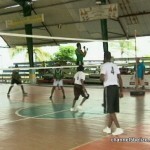 Meanwhile, all PLB matches from Week 6 were postponed due to the torrential rains that has ravaged the nation. 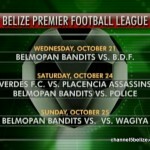 Matches should resume Wednesday night with Belmopan Bandits battling B.D.F. at the F.F.B.—that is if the rain subsides. 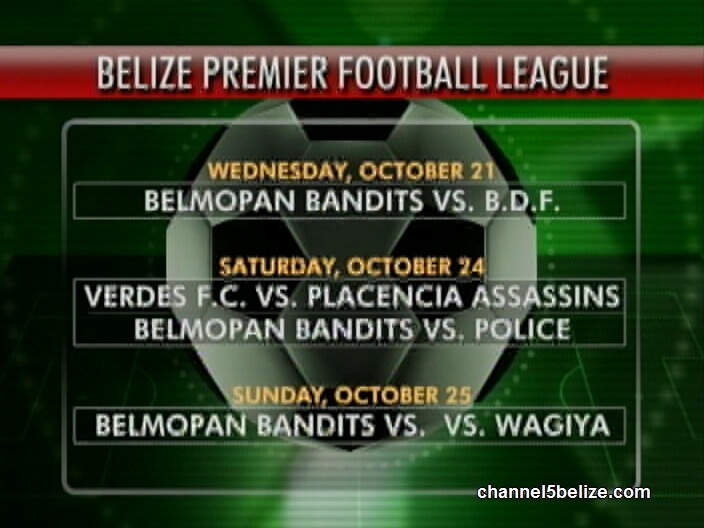 Verdes FC should then play Placencia Assassins on Saturday at the Michael Ashcroft, but it is very unlikely Verdes will return in time for this scheduled match. 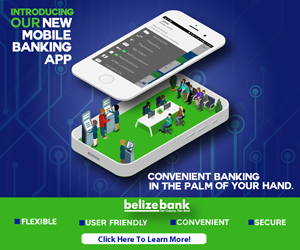 Still, the Belmopan Bandits are detailed to face the Police at the F.F.B. comes Saturday and on Sunday, the B.D.F. marches against Wagiya at the F.F.B. stadium. 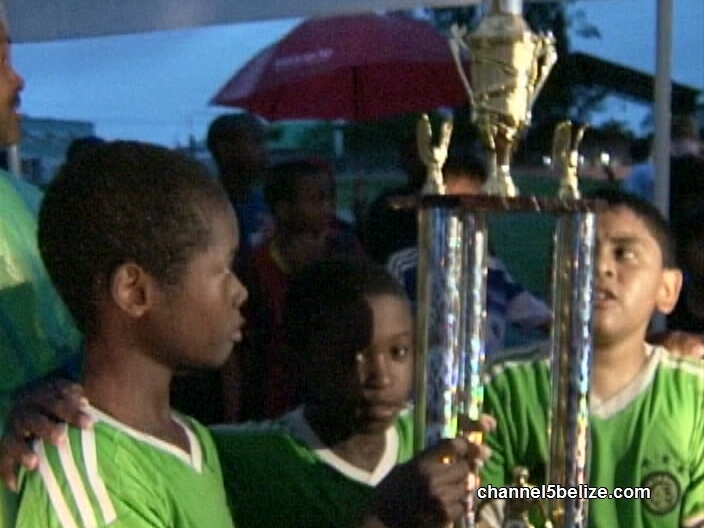 Turning to the Orange Walk Mundialito finals, Kate Jones led Vibes Alive into the winner takes all against Belarmino Esquivel and Young School and these youngsters would have to brave the inclement weather and a soggy pitch. David Bobadilla gets the opportunity to give Vibes Alive the opening goal with this run only to be thwarted by the better run from Calvin Reid. However, Menalio Novelo comes up with this beauty off this long distance set pieve that crashes into the far corner of the net for the 1-zip Yougn School. lead. Kate Jones tried to reply with this offering that veers outside the target. Belarmino esquivel is a born talent people—he steals this ball and dances through traffic but bites off a bit more than he could chew. Again, kate Jones looks for the equalizer off the set and this time she is denied by goalkeeper, Jaevan Smith. We’re in the 2nd half play when Luis Castellanos fires at goal to double the lead, but the keeper comes up with the stop. Menalio Novelo shows off his shot again and again; it’s a big time save from Rudolph Ramclam. Kate Jones still in the hunt for equalizer is denied by Jaevan Smith. 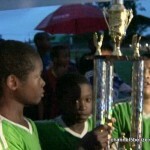 Yougn Schools go on to grab the Mundiality title with 1-zip big win and we say congratulations. In the Awards Ceremony, Belarmino Esquivel of Young School emerged with MVP honors. Kate Jones of Vibes Alive takes hom the most goals scored with 8 and the best goalkeeper award went to Justin Cardinas of Blackwater Stars. Congrats to all. In dominos news, Special effects featuring Wayne Wiltshire, Edmund Guy, David Fernandez and Erwin Woodye defeated Eagles to take top honors in the Mike’s One-Day 8 ball tournament staged at Mike’s Cue Lounge at Belmopan. 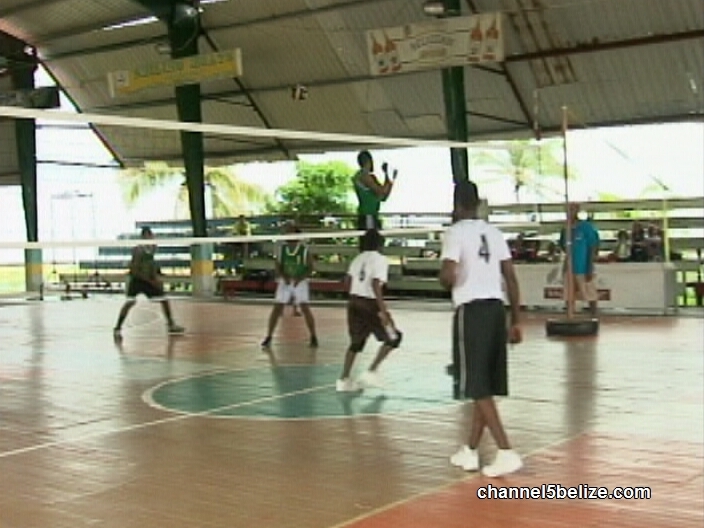 Finally in volleyball news, Gwen Liz High School and Nazarene faced each other in Belize District Tournament play on Saturday at Bird’s Isle. Gwen Liz took the 1st set in a 25-21 score. Unfortunately in the 2nd set with Gwen liz leading 11 to 3, a ferocious downpour fell on the venue, forcing the cancellation of further play. The match has been rescheduled but at press time, we were unable to ascertain same.